Why would anyone be afraid of this? Shark week just started and for some reason people are fascinated. Might be that they love Sharknado with all in terrifying special effects or the fact that they want to see someone get swallowed by a shark, or that the summer sun has finally gotten to them and they just can’t think straight anymore. Sharks may be terrifying to some people, but there is an easy way to avoid them. Swim in a pool or don’t swim in the ocean. Pretty simple. But what about spiders? They are way smaller, they have way tinier teeth and a simple movement of the shoe and the screaming dies. Is it because spiders are smaller and can somehow make it inside the house? Is it because spiders, while much smaller than sharks can still kill a human with its venom? Not sure, but for some reason, if you ask a room full of people what they are afraid of at least one is going to mention spiders. I don’t know about you, but if someone was willing to burn down their house just to get rid of a few spiders, there is definitely some irrational fear going on with the spiders. The black widow spider, the American House spider, the Brown Recluse Spider, they are all scary spiders that may frighten people. But what about the Daddy Long Legs? Talk about the spider that gets no respect. Why when someone sees one of those are they not cowering in fear? What did the Daddy Long Legs ever do that was so non lethal that you aren’t running out of the house in fear? Calling your local exterminator to kill them before you can ever take a shower again. I swear the Daddy Long Legs get no respect. They are the Dolphins of the Shark World. The MC Hammer of the Rap World. The Rodney Dangerfield of Comedy. The Ben’s Bitter Blog of WordPress. What did the Daddy Long Legs ever do to earn your disdain? Your lack of fright? Your non burning down the house of respect? You meh of terror? If I were a Daddy Long Legs, I would be pretty bitter that while all my brother spiders scare the living crap out of people, I walk around with my long lean legs, that stick out like a sore index finger telling the world, “Don’t fear me! I’m non poisonous! I walk slowly! I am so easily squished, but why would you even bother?” There is also the fact that while other spiders are terrifying because they are mother like spiders protecting their children, I’m just the daddy, wearing the stained tank top, watching sports all day, and eating brats(not bratty kids, sicko, bratwursts). I guess I can see why no one is afraid of the daddy long legs, but they are still bitter! So, why are you not afraid of the Daddy Long Legs? Why do they get so little respect? They’re not really spiders (ask for ID). Real spiders laugh at them. Yep, they are the nerds of the spider world. I’m sure glad that I could perpetuate your love of spiders. I’m sure that the prank in the gifs wouldn’t have made you hate the person doing it all. 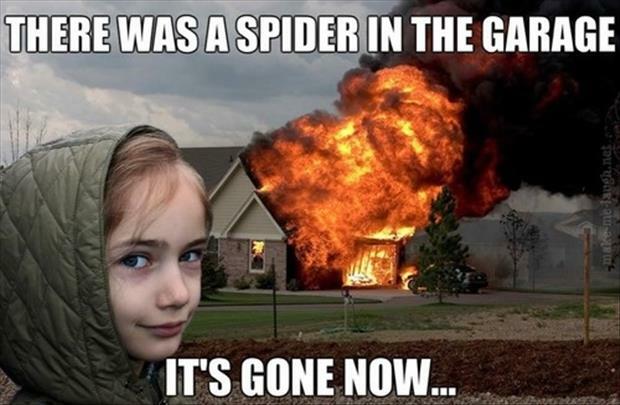 I’m guessing you would be the type to burn down the house in order to rid the house of one spider? I wouldn’t go THIS far, however I have been known to stop going into rooms where I saw one. This was a major problem when it happened in the bathroom!! Hopefully you have another bathroom in the house? Seattle is about the same almost all year, between 40-60 and cloudy and rainy. Summer only happen for about 4-6 weeks here and the spiders love coming inside to visit. Unfortunately, mice love it here too. I found a huge rat on my grill and screamed like a little girl. Gave me the heebeejeebees. You shouldn’t have heard good things about Seattle. It is pretty much like Ireland, raining, cold and depressing. Don’t let the few months of the year when we get a peek at rain fool you. Weirdly, I’ve heard that Charleston, SC is a great place to go. California has all kinds of different types of places, LA, San Diego, San Francisco. Portland, Oregon is a slightly sunnier Seattle; Austin, TX is a fun, eclectic type of city. I haven’t been everywhere but those are a few fun places I’ve heard of. Daddy Long Leggs or DLL might not command much respect in the fear department but he’s got some tricks up his sleeve. He can vibrate rapidly and ‘blur’ his speed so prey has a hard time focusing on him. He also invades the webs of other spiders and steals their prey and eggs. He’s a conniving little devil. There’s more to DLL than just ‘the daddy, wearing the stained tank top, watching sports all day, and eating brats(not bratty kids, sicko, bratwursts)’. While the recluse and black widow are shooting down the place, he’s quietly taking over the world. And if he gets ANYWHERE near me I’ll stomp him DEAD. I hate spiders. Someone seems a little bitter about DLL’s. Since the metaphor was for me, I guess that means I’m subtly taking over the world, one quietly bitter post at a time? It’s always the quiet ones you got to watch for, lol. Sneaky, very sneaky. Yep, me and the Brain from Pinky and the Brain. You would never suspect us. I’m pretty sure Pinky looks at me and feels smart. Actually most vile behaviors are mostly me. Males just get lumped along with me because I just happen to be male. They should just called them Daddy Bitter Legs. Actually I assume both males and female DLL behave this way, but I was responding to Ben’s blog so I was being humorously sarcastic (and apparently failing). Sorry if I offended you, it wasn’t my intention. I was not offended at all, but it was kind of you to address the possibility. I just consider it a quiet mission to remind writers and readers–even myself, at times–to appropriately include genital innies (yes, I know: mammalist 😉 ). Only you could pull this post off, BF. Only you . . . I think that is either a really nice compliment, or it tells me that I am a little off kilter. Or both. Thank Husband for saying so too. You smash them? Man, I’m never visiting YOUR house, Killer Ben! Well, I guess you aren’t invited to my house then. But if you ever need some taken care of at your house….Bitter Killer Ben is on the loose. Hmmm… ‘Bitter Killer Ben’ has a nice ring to it, don’t you think? Yeah, sounds good. Where do I sign up? Police station? Bitter’s Most Wanted? How about the morgue? Pretty bitter there. I’ve heard the people there don’t care much anymore. Except for the few bitter ghosts that forget to leave the place. Wait… people aren’t afraid of Daddy Long Legs? I abhor them! They are so easily fling-able and my friends (or I guess maybe they are my enemies) know this. But seriously… maybe it’s their name: “Daddy” gives the impression that they are big lovable softies. But I still hate them. And all spiders frankly. Nope most people are okay with them. Unless they aren’t. I have loved Daddy Long Leg spiders since I was a child. Anyone who hurts one is just cruel. I try to leave other spiders alone because they do a better job of killing annoying bugs than I would, but they do give me some creeps when unexpected! I usually let the Daddy Long Legs go, unless my kids are freaked out. Then it is my job to get rid of them. It would be nice if they weren’t in the home. But I would take them over any other spider. I’m the designated smasher in my house. I always laugh when my kids freak out, because most of the ones they see are Daddy Long legs and they are smaller than a crumb. Those i can deal with. It’s the legs, they’re so long and creepy. I think it’s also because they allow the spider to move very quickly, thus increasing the fear factor. So the long legs make it worse? But in the end wouldn’t you take a daddy long legs that would just run fast, over a recluse spider bite that would cause you to swell up like a balloon all over your body? Just sayin’. They are just the brats of spiders. They spin the webs that annoy you, but in the end just harmless. I don’t care WHAT kind of spider it is. If it’s in my house, and not helping pay the rent, It’s getting the shoe. Sorry. Wow, even a daddy long legs? So harmless, so long legs, so just not even worth it. Nope… if it’s not helping pay the rent, it’s dead. No second thought about it. I don’t care how long it’s legs are or if it has wings. If it’s a bug, in my house, it’s as good as dead. End of story. I get the feeling that you have something against dads with long legs, amirite? Oh… now that you say that… my son’s dad is 6’10”. You might be onto something there. I usually have smart observations, by mistake. I would call myself the mistaken genius.